“You may not always end up where you thought you were going, but you will always end up where you are meant to be.” This quote inspires senior, Megan Gray. Megan is the daughter of Ted & Tonja Metcalf, but she is not just your average young woman. She stands out because of her willingness to help others, even if it doesn’t benefit her personally. 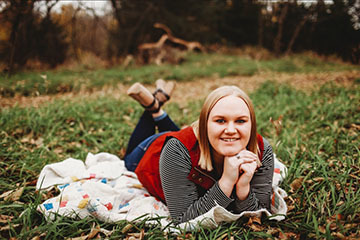 Throughout her high school career, Megan has been involved in many activities, including volleyball, cheerleading, band, and drill team, as well as clubs such as FCCLA, art, student council, and peer mentor. Outside of school, she is involved in Footloose Dance and the Marshall County Community Band. The accomplishment she is most proud of, however, was being invited by the Kansas Ambassadors of Music to travel in Europe and perform with their band. Megan’s greatest inspiration was her grandma, Carol Hood. She helped Megan realize how much helping students impacts their daily lives, even out of high school. That is why Megan’s dream is to become an inspiration to students of her own, by helping them to accomplish their goals and have success. The word that best describes Megan is organized. She always knows where things are, and has a plan of action. Her post-graduation plans are to attend Fort Hays State University to major in elementary education. Megan confesses, “One memory from high school I will never forget was when Kyra McCubbin took our phones after cheer tryouts, right before our performance with Presidio Brass along with Marysville’s band, because we wanted to know who made the squad.” Once she leaves Valley Heights, Megan wants to be remembered for her good leadership, and her ability to give good advice to anybody in need.